Se trata de un disco mágico, pues además de la afinidad del director con las obras de Mozart, la toma de sonido es fantástica, pues nos deja oir los cuatro conjuntos orquestales con total claridad. Bad weather in Salzburg, particularly during the dark and wet months of December and January, placed a large role in the creation of Mozart’s Notturni. Domestic music-making offered the upper classes a little cheer during the dreary winter months. Serenades by the Salzburg maestro were performed for entertainment and greatly influenced chamber and symphonic music. The Overture to Lucio Silla is from an opera which tells the story of the bloody political dispute of the Roman general Lucio Silla. This highly developed work deviated from the norms of compositions, and this was perhaps the reason why it was not as popular in Milan as Mozart’s other works with the result that he receoved no more commissions from Italian opera houses. The music written for the historical drama Thamos, König von Ägypten was unique for Mozart, although this kind of music was not unusual for its day. The so-called entr’actes served to fill the time between scenes or acts. 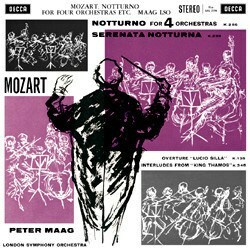 Peter Maag and the London Symphony Orchestra stage an excellent performance with their exquisite tone, exemplary dynamics and shaping of this wonderful music which reveals the splendidly colourful scores of one of the greatest musical phenomena: Wolfgang Amadeus Mozart.